You are (presumably) a person. The people you are trying to reach with your brand’s message are, amazingly, people as well. Content works better when it comes from a place of empathy—that is, when you know your audience and can speak to them on a personal level. Empathy starts with a deep understanding of your audience, gained by social listening, interviews, and persona-building. But you can have a deep understanding of your audience and still fail to tell the stories that will engage them. When you use the insight you have to tell a story that resonates, that’s empathy in action. Here are three types of empathetic stories you can tell in your content, complete with examples from brands who got it right. Note these types of stories all go beyond the intersection of person and brand—they consider people beyond the small data point where they become customers. That’s why I love this ad from CVS. In 30 seconds, it clearly addresses a specific audience, tells them it’s going to be okay, and tells them why. It may lean a little too heavily on the promotional side in those last few seconds, but it’s in the context of, “you’re going to be okay, because we’re going to help you.” As someone who is intimately familiar with the little days-of-the-week pill boxes, these 30 dialog-free seconds had me blinking back tears. Speaking of blinking back tears, take a few minutes to watch this short video from Extra Space Storage. I’ll wait while you grab a tissue. It sure is dusty in the office today, isn’t it? Makes your eyes water like crazy. Extra Space Storage had a message about their brand they wanted to get across: “We have storage solutions for people starting a family.” That’s what they needed to say. But that’s not what their target audience needs to hear. To get at the right story for their target audience of couples freaked out about having a baby, they brought in a multi-cultural, multi-generational cast of real-life parents to give their best advice. The result is a heartwarming, genuinely informative, funny, touching video. That also, by the way, conveys the message the brand wanted to get across in the first place. After those first two videos, I’m sure some of my fellow B2B marketers are feeling a growing sense of despair. Sure, those B2C guys can make beautiful videos about health and babies and whatnot. But we’re talking about serious business things with serious business people. Or maybe you can. IBM doesn’t skimp on the hard facts in this brief video, but uses humor to keep it relatable and make the message easier to swallow. They let the URL at the end do the heavy lifting to keep the video short and zippy. Most importantly, they remember that behind every ‘B’ in B2B, there’s a person. Content marketing requires putting the empathy you have for your audience to a constructive purpose. When you empathetically tell the story they need to hear, you can help lead them to the place they need to go. And that place just happens to be—thanks to your smart targeting and thorough research—where your solution is the best answer. 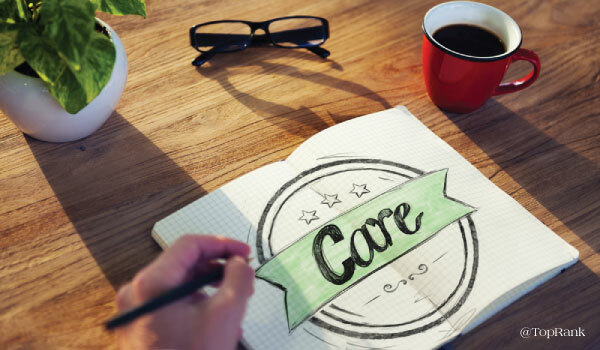 How do you put empathy in action in your marketing efforts? Let me know in the comments. Could your business use stellar content with solid strategy to back it up? We’re here to help. You had me until the second video. With two young kids (6 & 2), I will admit, there were tears that started to form. A beautiful video indeed that Extra Space Storage NAILS! I am with a business in the press release service and distribution industry, 24-7 Press Release Newswire and mention this because exactly what you are mentioning. We are starting to see more press releases that ARE doing exactly what you are saying and tugging on those emotional heart strings. Saying the right things, consoling their audience and doing exactly like you say, ‘telling them it will be alright’. Those press releases are the successful ones. They are the ones that are being shared and have the highest number of views. Coincidentally, we just finished a piece (to be posted shortly) about the cross of ‘content marketing into the press release world’. Thank you for a wonderful article Joshua. It really hit home. Please let me know when that piece publishes, Michael. I’d be interested to read it. I definitely think press releases are evolving from a more company or product-centered approach, to one that considers the audience. That’s a good thing.